I graciously received an ARC from the author in exchange for an honest review. Kaiya escapes her ordeal at the hands of the Teleri Emperor, only to return to a homeland beset by enemies on all sides, and crumbling from within. As a teenager, she quelled a rebellion with the Dragon Scale Lute. As a young adult, she vanquished a dragon with the power of her voice. Now, robbed of her magic by grief, Kaiya must navigate a web of court intrigue to save the realm before it falls. Only she can lay claim to the Dragon Throne on behalf of her unborn sons—whether the father is the lover who perished rescuing her, or the hated enemy who killed him. In the final story in Kaiya’s saga, she must rally a nation, repel invaders, and prove to the world why her family alone holds the Mandate of Heaven. 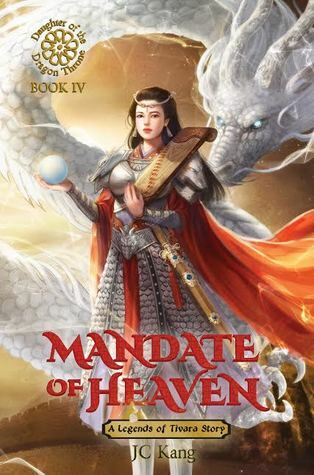 With political power, full rule over Cathy, life, magic, dragons and the battle over gaining the true Mandate of Heaven all on the line, the fourth and final installment in the Daughter of The Dragon Throne series, this epic, high fantasy story is sure to keep your attention. Last I spoke about Kaiya and her entourage, I gave a few things away, so with I’ll just try to focus on what I enjoyed the most and why I loved this book. As this tale came to an end, I realized how hard it would be to pick a favorite book from this series. All of the characters have changed and at times I found myself empathizing with a few characters that have been plotting and manipulating people from the very beginning. I also loved Mandate of Heaven because of its overall mixture of drama, action, suspense and touches of humor. Which gave book a familiar narrative tone of all of the three previous books all wrapped up into one. Still at the heart of it all, at only nineteen and a half years old, Princess Kaiya has survived assassination attempts, dragons, dark magic, captivity and the loss of loved ones in just a manner of three years. But she continues to face the harshness of a reality she’s never imagined as she does all she can to to save her people, her country and restore the peace in a land that’s falling a part on every direction. Using what she’s learned from both friend and foe in regard to magic, political strategy, feigning indifference and subtle coercing to bring about the end of a war. On top of the satisfying conclusion to this saga, I loved the fact that the author still had so many other surprises left for the readers of this story. Like the final pieces of the prologue scene, Lord Xu revealing the truth about Kaiya’s ancestors, our return to the wilds, Leina, Lady Zheng’s change of heart, Peng’s attempt at a final “swan song” sort of speak, Jie’s birthright, Kiri and her (forgetful) friend as it were and so much more. I had a great time getting to know all of these characters and wandering the lands of Cathay. I’d recommend these books to anyone who love adventure/suspense and historical, high-epic fantasy stories. Thanks so much for reading ^_^.